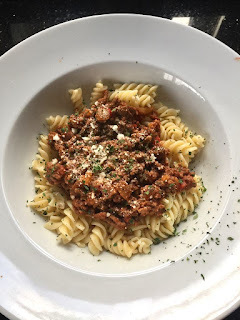 There are many versions and ways to create delicious bolognese. Depending on how much time i got or what my energy levels are! Here is a very simple and quick version for when you are caught for time.........but still tasty tasty! Brown some beef mince off in a skillet with some seasoning. Drain the mince through a colander and return to the skillet. Off the heat add in plenty of fresh garlic; dried oregano; fresh basil; sea salt and black pepper. Along with 2tblsp tomato puree. Back on the heat, turned now to medium, mix to combine. Add a tin of chopped tomatoes or a carton of passata. Pour some water into the empty tin or carton to use up every last bit of that yummy tomato juice and pour into skillet. Next i add in whatever veggies you fancy (you can saute these separately if you prefer but as this is a quick easy version, i feel there's no need). Here I've added chopped peppers; onions; courgette and mushroom. Add a little more water if you feel the need. I like to simmer for about half an hour - 40mins checking if more water needed. Serve with pasta of choice, grated Parmesan, black pepper and some fresh parsley.